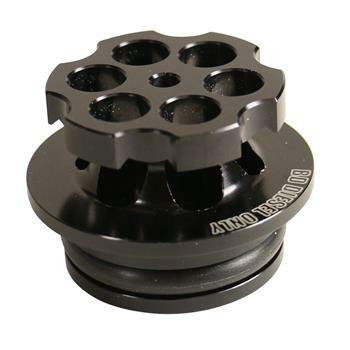 BD’s anodized billet aluminum Patriot Fuel Plug is the most unique addition to your 2013-16 Dodge 6.7 Cummins & 2014-16 EcoDiesel. Insert spent 9mm casings for a custom six shooter cylinder look. O-ring ensures a tight fit and prevents contaminates entering your fuel tank. Magnetized base allows attachment to prevent loss when fueling.